Our RV park caters to seniors with the traveling bug. But our prices will encourage you to extend your visit. Orange County, California, is one of those places people love to visit. Or, maybe they’d even like to move here. Orange County, California, is known for its wonderful Mediterranean climate, fabulous beaches, unique entertainment, and for being the home of the original Disneyland. Fortunately, for those seeking an affordable way to take advantage of all it offers, Orange County also is home to Parque Santiago Mobile Home Park in Tustin. We at Parque Santiago Mobile Home Park welcome our short-term visitors to the area, as well as a long term RV park for those who want to make a home here. The park features gorgeous, manicured lots that provide privacy and security. Our RV lots are a full 8 feet wide and 29 to 40 feet long, capable of handling the most extreme RVs on the road. 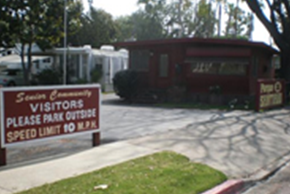 Parque Santiago is one of the few mobile home and RV parks in the area that specifically caters to our senior population. Security and providing for a warm, relaxing living environment are our primary concerns. Visitors will find comfort and beauty at a welcome low price, regardless of the length of your stay. The traditional RV parks in Orange County have a price arrangement that can make a long stay prohibitively costly. But at Parque Santiago, our prices are geared for the visitor planning on staying long term. Our goal at Parque Santiago Mobile Home Park is to be the premier location for low-cost senior living in the greater Orange County area. We strive to make life here as relaxing as possible, with a variety of options so you can live at the pace you set. Orange County is already a favorite spot in Southern California, drawing many newcomers from around the country and around the world to our back yard. We have a leg up on other parks that are just arriving, because we have a prime location that provides easy access to the beaches and entertainment spots the region is known for. When it’s time to pack up for an extended trip away from the cares of daily life, or when you want to make a new spot your home for a long term stay, we have the lot waiting for you at Parque Santiago Mobile Home Park. Call us for details.